Charting a course in our lives though stormy circumstances and uncertain seas can be difficult if not impossible. What we need is a reliable compass and a sturdy set of charts to guide us to safer harbours. God’s Word offers such direction in tough times as the lives of great men and women of courage and faith are put on full display. We can learn to follow God and stay on course through the storms of our lives by following these rich examples of faith. 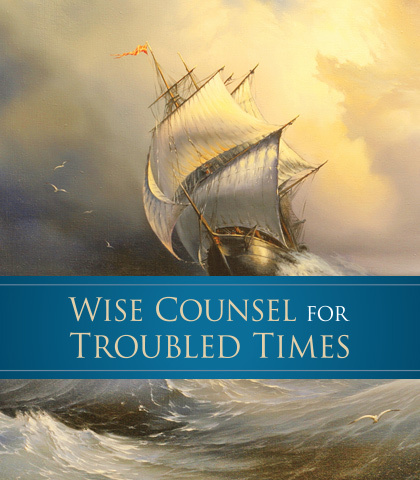 Chuck Swindoll’s series Wise Counsel for Troubled Times introduces you to these courageous and wise individuals. By looking closely into their lives and carefully applying what they learned about overcoming challenges, you, too, can stay upright and endure whatever stormy seas come your way, fastened to the mainstay of God’s Word. “Familiarity breeds contempt” is an old cliché because it’s nearly always true. However, before contempt, familiarity breeds complacency—a ho-hum attitude that is satisfied with the status quo. If we’re not careful, complacency will then breed cynicism, which is a kissing cousin of contempt. We’ve broken the world. And each of us is responsible. Down deep in our souls lies a little rebel that sometimes whispers and sometimes yells for us to go our own way. Inevitably, when we do, we stumble into a moral morass. “Never give up, never give in.” This could have been the motto of Paul’s life. Quit simply wasn’t in the man’s vocabulary. We ought to erase it from ours as well. And we can if we’ll hear and heed Paul’s last words to his friend, Timothy. Thinking is hard work. Perhaps that’s why so few people engage in it. Precise, perceptive thinking doesn’t come to the lazy; it only comes to those with mental determination and discipline. But in a society that thinks with its feelings, how are we to know what is right and reliable? This is the story of David and Abigail—of a strong man who admired a strong woman; a wise man who listened to an even wiser woman. This can be our story too, if we’re wise enough to follow her example and adopt her motto. Nehemiah was known and respected for his diligence as a contractor and builder, while his contemporary, Ezra was a dedicated scribe and priest. History is replete with the power of one; with those who owned the rare commodity of moral courage—those daring individuals who were “willing to brave the disapproval of their fellows, the censure of their colleagues, and the wrath of their society.” Esther was one of those. Rebellious; selfish; litigious: each an apt description of modern society. Gone are the days, or so it seems, of teachable spirits, humility, and respect for authority. All who come to God must empty themselves of themselves. They must set aside their self-centredness, selfish ambition, and self-sufficiency. In other words, they must put away pride and put on humility. God offers to each of us at least two great moments in life: the moment when we were born—though we might not wish to dwell on the number of birthdays from that day to this—and the moment we realize why we were born. Few character qualities are more important than integrity. Courage is perhaps the only one to precede it, since it stiffens our spines and sets our feet. If everyone practiced the philosophy of an eye for an eye we’d all be blind. You see, grinding resentment isn’t resolved with revenge; it’s resolved with grace. Before Paul put the final period on his first letter to the Thessalonians he issued a double-edged command: “encourage…and build up one another” (1 Thessalonians 5:11). In a world more sinful than saintly, such a command is necessary because the spirit of discouragement is dangerous.